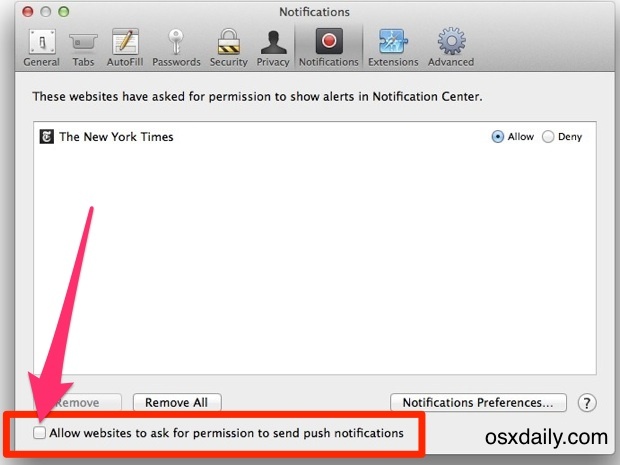 Effectively, this walkthrough will stop alerts like that from showing up anywhere in Safari. Do note this is different from stopping notifications from websites that you’ve already accepted, in that it doesn’t turn off the notification feature, it simply turns off new permissions requests when visiting sites that want to push alerts to you. If you like the push notification feature of Safari, you should leave this enabled so that you can continue to receive new alerts from new websites. Don’t see the checkbox for opting out of push permission requests? You probably need to update Safari to a newer version. Currently, in order to have this universal push opt-out / ignore option available to you, users must have at least Safari 7.0.3 installed or newer, which arrived along with OS X Security Update 2014-002 1.0. If you haven’t installed that update yet, you should do so not only to receive this new feature option for Safari, but also to gain additional security fixes for your Mac. In other words, all modern versions of Safari and Mac OS offer the ability to disable all push notification requests. Again, this is different from disabling Notifications from websites. In fact, you can keep the requests disabled while still allowing pushes to come through for existing websites that have been allowed, though new sites that either use or implement the feature will no longer be able to ask to send them to you. Thus a better option for many is to simply disable the feature for sites they don’t want the alerts coming in from, or to simply temporarily turn off the Mac Notification Center if you’re trying to focus and limit the incoming alert popups. 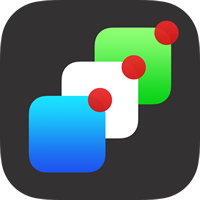 We could support the push feature now for OSXDaily.com, perhaps we should give it a try? I wonder if OSXDaily would get fewer hits if the push notifications were activated? People might not view the site unless they get a notice of something that interests them instead of coming to the site daily to check it out, like I do. Maybe that isn’t how it works, I’m not sure. What I think is OSXDaily.com should support it for a short testing period, and if it affects negatively like Toby suggests, turn the feature off. But I’m not an expert, so you should use your judgement! I’m in the camp of being annoyed by these so this is good I can them off. Besides the messages coming on both my iPhone and Mac, and phone calls, and so many notifications. I am glad I can devote my time to each device individual. I was becoming overwhelmed with notifications.